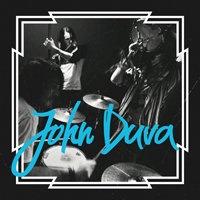 JOHN DUVA is a band from Åre in northern Sweden; a place where they've lived and played together for a long time. Lately, the band moved south, to the archipelagos of Stockholm. They are all traveling from different cities in Sweden to meet up and play on the island of Yxlan, Stockholm, pretty much all the time! With an attitude and a burning passion, they meet up to play and to dispose the frustration of waking up and wasting their time with routines and everyday jobs. This is the main factor for their inspiration, and the heart of their music; to break free from standard living and create a reality of their own which consists of music and pure energy. JOHN DUVA is band that you don't categorize, simply because of the variated impressions they use in their music and lyrics. Think The Hives meets King Khan & The Shrines, combined with garage, punk & psych, and you might on your way of getting the picture! Troglodyte Records and JOHN DUVA found each other rather quickly, and as a result the debut of JOHN DUVA will be released by Troglodyte Records in February!